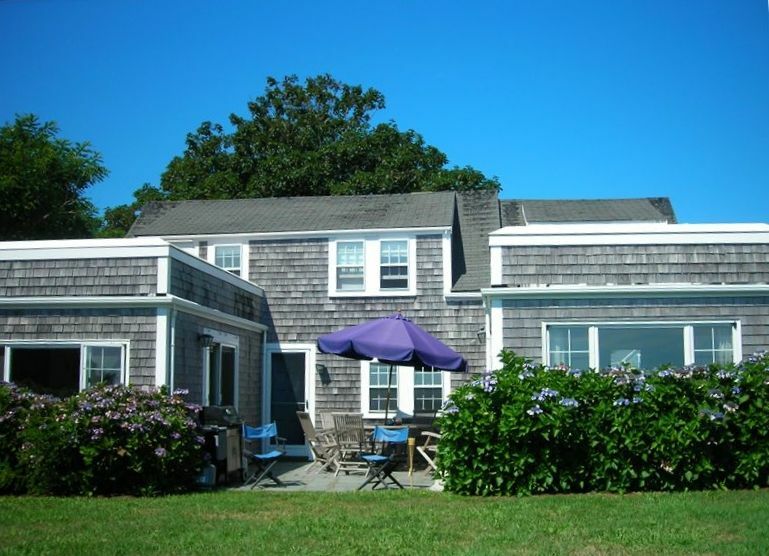 This charming house is located on the bluff in Siasconset village on Nantucket Island with nothing between it and Spain (except the ocean of course). It is a few minutes walk from the Siasconset stores - groceries, ice cream, cafe etc. On the second floor, the house has a master (queen bed plus single bed) with an adjoining room with twin beds and a sink. Additionally upstairs, there is another queen bed room and a single-bed room and a full bath with tub and shower. Both the master bedroom and the other queen room have a large walk out deck overlooking the ocean. There is an enclosed outdoor shower and steps down to the private beach. There is a strong undercurrent here so it is recommended you walk down the beach to the public section where there is a lifeguard for swimming. The house if furnished with lovely seaside decor and is in a great location with a long private driveway and parking for two cars. The yard has plenty of room for croquet/volleyball etc..
On the property, there is a separate cottage (sleeps 5) that can be rented with the house or separately. Please see VRBO #15704. It sleeps up to 5 with one bedroom with 2 twin beds, a pull out queen couch in the living room, and a twin bed in a bonus room. It is ideal for a single vacationer, couple or small family. There is hardly ever a need but we do have several window air conditioners in living room and master bedroom. We have parking places on our yard. Great renowned restaurants, and wonderful stargazing from 30 miles out to sea!